“Y:Cube is such a good idea and project”, says 22 year old Shantae Whyte. On Monday April 28th she will gather her belongings and move from her room in YMCA Wimbledon to the red and black Y:Cube prototype currently placed outside the hostel.For one week, Shantae will get to experience living in the acclaimed self-contained studio apartment designed by world renowned architects Rogers Stirk Harbour + Partners. She will be writing daily blog posts and updates on social media on everything from the temperature inside the Y:Cube, how much storage space there is, what she gets up to and what’s for dinner. “What I look forward to most is to cook my own food”, she explains. “Living in the YMCA, I really miss having a kitchen and being able to decide myself what to eat”. 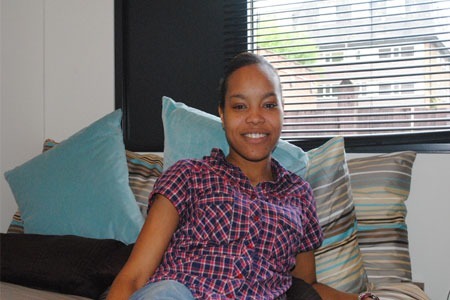 Shantae has been a resident in the hostel in YMCA Wimbledon for two months. She became homeless because of family issues, making her one of the many young people between the age of 16 and 24 who become homeless due to relatives or to friends no longer being able or willing to provide accommodation (source: YMCA England, Dec 2013). “I was thrown into a never ending loop where I was referred from Merton council to Croydon council and from Croydon to Lambeth before I was referred back to Merton. Everyone I talked to told me different information and it was a time of emotional stress and financial strain”. Shantae recalls her homeless situation as extremely tough and stressful. She constantly sought advice and assistance from her local authority but felt that they just brushed her off and that no one took her seriously. She explains: “In the end I had an episode and broke down in the Merton Council offices, simply because I was so exhausted of being a shuttled between different councils and agencies that I couldn’t take it anymore. I think they almost called security to take me away, but luckily, after this they actually looked into my case and shortly after I was referred to YMCA Wimbledon”. For the whole time Shantae was without a place to call her own, she was also in college studying for a degree in Health and Social Care, level 1 and 2. “It was my mum that wanted me to study Health and Social Care, and even though I wasn’t particularly into it I pulled through because I think it’s really important getting an education. Also, I know they are always looking for people in the NHS”, she explains. Today, however, Shantae has made a career change in to Catering and Hospitality. Through the Prince’s Trust charity she recently did a work placement with Marks and Spencer, which again led to her being offered a job in their café. In addition, she has been volunteering in the Canteen café at YMCA Hawker in North Kingston. And with the stay in the Y:Cube coming up shortly, she will get the opportunity to practice her cooking skills in a kitchen that is her own – at least for a week.